Covering the Head During Prayer. Jewish custom has for ages required women to cover the hair as an evidence of their modesty before men, and required men to cover the head in order to show their humility and reverence before God. In ancient Biblical times there is no indication that women covered their hair except with head-gears for ornament. The Shulammite's long flowing locks are an object of admiration in the Song of Songs (iv. 1; vi. 5; vii. 5; compare Ezek. xvi. 7); and much art is bestowed in coquetry upon the braiding (see Isa. iii. 24; II Sam. xiv. 26; Judges xiii.). The woman suspected of adultery was therefore signally disgraced, or humiliated like a mourner, when for punishment her head was disheveled by the priest (Num. v. 18; compare Lev. xxi. 10; A. V. "uncover"); and shaving off the hair was an insult inflicted only on captive women (Jer. vii. 29; I Cor. xi. 15). "On, the son of Peleth, companion of Korah, was saved through the device of his wife, who, having made him so drunk that he fell asleep, sat with her daughter in front of the tent, both having their hair uncovered. When On's companions came to call for him, and saw the women in such an attitude, they turned away; for no one would enter a house where this Jewish custom was so openly disregarded." The distinction of Ḳamḥit, who saw seven of her sons made high priests, and two officiate on one and the same day, one of them being Simon ben Ḳamḥit, mentioned by Josephus ("Ant." xviii. 2, § 2) as"Simon, the son of Camithus," is ascribed by the Rabbis to the fact that even the ceiling of her house had not seen the hair of her head (Yer. Meg. i. 72a). Bareheadedness in a woman was, therefore, considered to be an indecorous form of "'ervah" (nakedness, Deut. xxiv. 1), an incentive to improper glances, and it was declared unlawful to recite the Shema' in the presence of a woman whose hair was uncovered (Ber. 24a; Shulḥan 'Aruk, Oraḥ Ḥayyim, 75, 2; Eben ha-'Ezer, 21, 2). Originally, this custom included both married and unmarried women, as may be learned from Ned. 30b. Nor does the law (B. Ḳ. 90a), which sets a fine of 400 drachmas upon a man who tears off a woman's head-gear in the street, make any distinction between a married and an unmarried woman. Also Paul (I Cor. xi. 3-12), when declaring that the woman should have her head covered in recognition of the man being her lord, refers to women in general, not to married women exclusively (see also "Apostolic Constitutions," i. 8). According to Pirḳe R. El. xiv., it is a result of Eve's curse that women must go about with the hair covered like mourners. Still, instances are given in the Talmud of unmarried women going about bareheaded, as when the Mishnah speaks of the bride being carried in the procession in her litter, with her hair hanging down (Ket. ii 1); or when the daughter of Naḳdemon ben Gorion covers her face with her hair when seen by Johanan ben Zakkai in her humble condition (Ket. 66b). Later, particularly in Occidental countries, it was not considered indecorous for unmarried women to go about bareheaded (Shulḥan 'Aruk, Oraḥ Ḥayyim, 75, 2, against "Yad," Issure Biah, xxi. 15). The married woman was henceforth all the more scrupulous in covering every part of her hair, probably because its concealment was the mark of distinction of married women among the people surrounding the Jews, as indicated in such expressions as "nubere" and "unter die Haube bringen." It seems that the Slavonian marriage-custom—according to which, with many lamentations over the destroyed beauty of her hair, the "kosah" (the girl's long plait) is taken off and at times sold (Ralston, "Songs of the Russian People," pp. 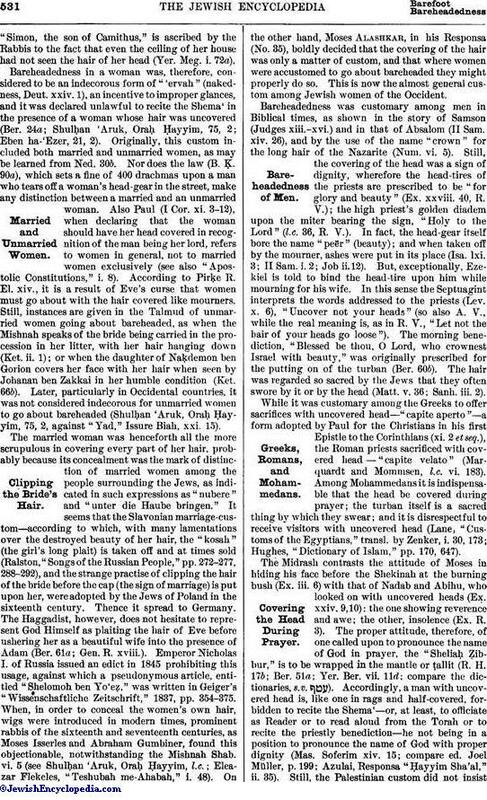 272-277, 288-292), and the strange practise of clipping the hair of the bride before the cap (the sign of marriage) is put upon her, were adopted by the Jews of Poland in the sixteenth century. Thence it spread to Germany. The Haggadist, however, does not hesitate to represent God Himself as plaiting the hair of Eve before ushering her as a beautiful wife into the presence of Adam (Ber. 61a; Gen. R. xviii.). Emperor Nicholas I. of Russia issued an edict in 1845 prohibiting this usage, against which a pseudonymous article, entitled "Shelomoh ben Yo'eẓ," was written in Geiger's "Wissenschaftliche Zeitschrift," 1837, pp. 354-375. When, in order to conceal the women's own hair, wigs were introduced in modern times, prominent rabbis of the sixteenth and seventeenth centuries, as Moses Isserles and Abraham Gumbiner, found this objectionable, notwithstanding the Mishnah Shab. vi. 5 (see Shulḥan 'Aruk, Oraḥ Ḥayyim, l.c. ; Eleazar Flekeles, "Teshubah me-Ahabah," i. 48). On the other hand, Moses Alashkar, in his Responsa (No. 35), boldly decided that the covering of the hair was only a matter of custom, and that where women were accustomed to go about bareheaded they might properly do so. This is now the almost general custom among Jewish women of the Occident. Bareheadedness was customary among men in Biblical times, as shown in the story of Samson (Judges xiii.-xvi.) and in that of Absalom (II Sam. xiv. 26), and by the use of the name "crown" for the long hair of the Nazarite (Num. vi. 5). Still, the covering of the head was a sign of dignity, wherefore the head-tires of the priests are prescribed to be "for glory and beauty" (Ex. xxviii. 40, R. V.); the high priest's golden diadem upon the miter bearing the sign, "Holy to the Lord" (l.c. 36, R. V.). In fact, the head-gear itself bore the name "peër" (beauty); and when taken off by the mourner, ashes were put in its place (Isa. lxi. 3; II Sam. i. 2; Job ii. 12). But, exceptionally, Ezekiel is told to bind the head-tire upon him while mourning for his wife. In this sense the Septuagint interprets the words addressed to the priests (Lev. x. 6), "Uncover not your heads" (so also A. V., while the real meaning is, as in R. V., "Let not the hair of your heads go loose"). The morning benediction, "Blessed be thou, O Lord, who crownest Israel with beauty," was originally prescribed for the putting on of the turban (Ber. 60b). The hair was regarded so sacred by the Jews that they often swore by it or by the head (Matt. v. 36; Sanh. iii. 2). While it was customary among the Greeks to offer sacrifices with uncovered head—"capite aperto"—a form adopted by Paul for the Christians in his first Epistle to the Corinthians (xi. 2 et seq. ), the Roman priests sacrificed with covered head—"capite velato" (Marquardt and Mommsen, l.c. vi. 183). Among Mohammedans it is indispensable that the head be covered during prayer; the turban itself is a sacred thing by which they swear; and it is disrespectful to receive visitors with uncovered head (Lane, "Customs of the Egyptians," transl. by Zenker, i. 30, 173; Hughes, "Dictionary of Islam," pp. 170, 647). The Midrash contrasts the attitude of Moses in hiding his face before the Shekinah at the burning bush (Ex. iii. 6) with that of Nadab and Abihu, who looked on with uncovered heads (Ex. xxiv. 9, 10): the one showing reverence and awe; the other, insolence (Ex. R. 3). The proper attitude, therefore, of one called upon to pronounce the name of God in prayer, the "Sheliaḥ Ẓibbur," is to be wrapped in the mantle or ṭallit (R. H. 17b; Ber. 51a; Yer. Ber. vii. 11d; compare the dictionaries, s.v. ). Accordingly, a man with uncovered head is, like one in rags and half-covered, forbidden to recite the Shema'—or, at least, to officiate as Reader or to read aloud from the Torah or to recite the priestly benediction—he not being in a position to pronounce the name of God with proper dignity (Mas. Soferim xiv. 15; compare ed. Joel Müller, p. 199; Azulai, Responsa "Ḥayyim Sha'al," ii. 35). Still, the Palestinian custom did not insiston the covering or veiling of the head at the priestly benediction (see Müller, "Ḥilluf Minhagim," p. 839). Isaac of Vienna (thirteenth century), in "Or Zarua'," ii. 43, states that the rabbis of France say the prayer with uncovered heads, and that on Simḥat Torah the boys are called up to the Torah bareheaded. 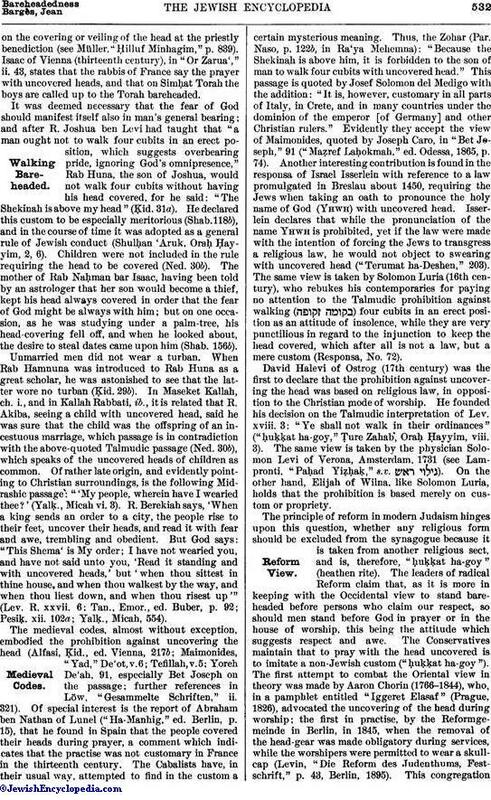 It was deemed necessary that the fear of God should manifest itself also in man's general bearing; and after R. Joshua ben Levi had taught that "a man ought not to walk four cubits in an erect position, which suggests overbearing pride, ignoring God's omnipresence," Rab Huna, the son of Joshua, would not walk four cubits without having his head covered, for he said: "The Shekinah is above my head" (Ḳid. 31a). He declared this custom to be especially meritorious (Shab. 118b), and in the course of time it was adopted as a general rule of Jewish conduct (Shulḥan 'Aruk, Oraḥ Ḥayyim, 2, 6). Children were not included in the rule requiring the head to be covered (Ned. 30b). The mother of Rab Naḥman bar Isaac, having been told by an astrologer that her son would become a thief, kept his head always covered in order that the fear of God might be always with him; but on one occasion, as he was studying under a palm-tree, his head-covering fell off, and when he looked about, the desire to steal dates came upon him (Shab. 156b). Unmarried men did not wear a turban. When Rab Hamnuna was introduced to Rab Huna as a great scholar, he was astonished to see that the latter wore no turban (Ḳid. 29b). In Maseket Kallah, ch. i., and in Kallah Rabbati, ib., it is related that R. Akiba, seeing a child with uncovered head, said he was sure that the child was the offspring of an incestuous marriage, which passage is in contradiction with the above-quoted Talmudic passage (Ned. 30b), which speaks of the uncovered heads of children as common. Of rather late origin, and evidently pointing to Christian surroundings, is the following Midrashic passage: "'My people, wherein have I wearied thee?' (Yalḳ., Micah vi. 3). R. Berekiah says, 'When a king sends an order to a city, the people rise to their feet, uncover their heads, and read it with fear and awe, trembling and obedient. But God says: "This Shema' is My order; I have not wearied you, and have not said unto you, 'Read it standing and with uncovered heads,' but 'when thou sittest in thine house, and when thou walkest by the way, and when thou liest down, and when thou risest up'" (Lev. R. xxvii. 6; Tan., Emor., ed. Buber, p. 92; Pesiḳ. xii. 102a; Yalḳ., Micah, 554). The medieval codes, almost without exception, embodied the prohibition against uncovering the head (Alfasi, Ḳid., ed. Vienna, 217b; Maimonides, "Yad," De'ot, v. 6; Tefillah, v. 5; Yoreh De'ah, 91, especially Bet Joseph on the passage; further references in Löw, "Gesammelte Schriften," ii. 321). Of special interest is the report of Abraham ben Nathan of Lunel ("Ha-Manhig," ed. Berlin, p. 15), that he found in Spain that the people covered their heads during prayer, a comment which indicates that the practise was not customary in France in the thirteenth century. The Cabalists have, in their usual way, attempted to find in the custom a certain mysterious meaning. Thus, the Zohar (Par. Naso, p. 122b, in Ra'ya Mehemna): "Because the Shekinah is above him, it is forbidden to the son of man to walk four cubits with uncovered head." This passage is quoted by Josef Solomon del Medigo with the addition: "It is, however, customary in all parts of Italy, in Crete, and in many countries under the dominion of the emperor [of Germany] and other Christian rulers." Evidently they accept the view of Maimonides, quoted by Joseph Caro, in "Bet Joseph," 91 ("Maẓref Laḥokmah," ed. Odessa, 1865, p. 74). Another interesting contribution is found in the responsa of Israel Isserlein with reference to a law promulgated in Breslau about 1450, requiring the Jews when taking an oath to pronounce the holy name of God (Yhwh) with uncovered head. Isserlein declares that while the pronunciation of the name Yhwh is prohibited, yet if the law were made with the intention of forcing the Jews to transgress a religious law, he would not object to swearing with uncovered head ("Terumat ha-Deshen," 203). The same view is taken by Solomon Luria (16th century), who rebukes his contemporaries for paying no attention to the Talmudic prohibition against walking ( ) four cubits in an erect position as an attitude of insolence, while they are very punctilious in regard to the injunction to keep the head covered, which after all is not a law, but a mere custom (Responsa, No. 72). David Halevi of Ostrog (17th century) was the first to declare that the prohibition against uncovering the head was based on religious law, in opposition to the Christian mode of worship. He founded his decision on the Talmudic interpretation of Lev. xviii. 3: "Ye shall not walk in their ordinances" ("ḥuḳḳat ha-goy," Ṭure Zahab, Oraḥ Ḥayyim, viii. 3). The same view is taken by the physician Solomon Levi of Verona, Amsterdam, 1731 (see Lampronti, "Paḥad Yiẓḥaḳ," s.v. ). On the other hand, Elijah of Wilna, like Solomon Luria, holds that the prohibition is based merely on custom or propriety. The principle of reform in modern Judaism hinges upon this question, whether any religious form should be excluded from the synagogue because it is taken from another religious sect, and is, therefore, "ḥuḳḳat ha-goy" (heathen rite). The leaders of radical Reform claim that, as it is more in keeping with the Occidental view to stand bareheaded before persons who claim our respect, so should men stand before God in prayer or in the house of worship, this being the attitude which suggests respect and awe. The Conservatives maintain that to pray with the head uncovered is to imitate a non-Jewish custom ("ḥuḳḳat ha-goy"). The first attempt to combat the Oriental view in theory was made by Aaron Chorin (1766-1844), who, in a pamphlet entitled "Iggeret Elasaf" (Prague, 1826), advocated the uncovering of the head during worship; the first in practise, by the Reformgemeinde in Berlin, in 1845, when the removal of the head-gear was made obligatory during services, while the worshipers were permitted to wear a skullcap (Levin, "Die Reform des Judenthums, Festschrift," p. 43, Berlin, 1895). This congregationhas, however, been the only one in Europe to adopt such a practise, and Grätz sees in it the chief reason for its failure to make propaganda ("Volksthümliche Gesch." iii. 737). Occasionally the parnas Hellwitz in Soest preached with uncovered head ("Allg. Zeit. des Jud." 1847, p. 448), while both Ludwig Philippson and Abraham Geiger preached in the Berlin Reformgemeinde with their heads covered (ib. 1845, p. 622). In America, praying with the head uncovered was first introduced in the Har Sinai Gemeinde in Baltimore and Temple Emanu-El and Adath Jeshurun of New York, and is now the prevalent custom in the Reform congregations of the United States, though in some it is optional with the members whether they worship with the head covered or uncovered. As part of the requirements of the Oath ("More Judaico"), most of the nations of Europe demanded (and some still demand) that the Jews swear with their heads covered (see Oath, Jewish). A law of Hungary, issued in 1517, demands that a Jew should swear "Pileum Judaicum in capite habens" (Busch, "Jahrbuch," vol. 82). Similar are the laws of Saxony, Nov. 22, 1838; May 13, 1839; and May 30, 1840; of Schaumburg-Lippe, March 19, 1842; of Denmark, 1843 ("Allg. Zeit. des Jud." 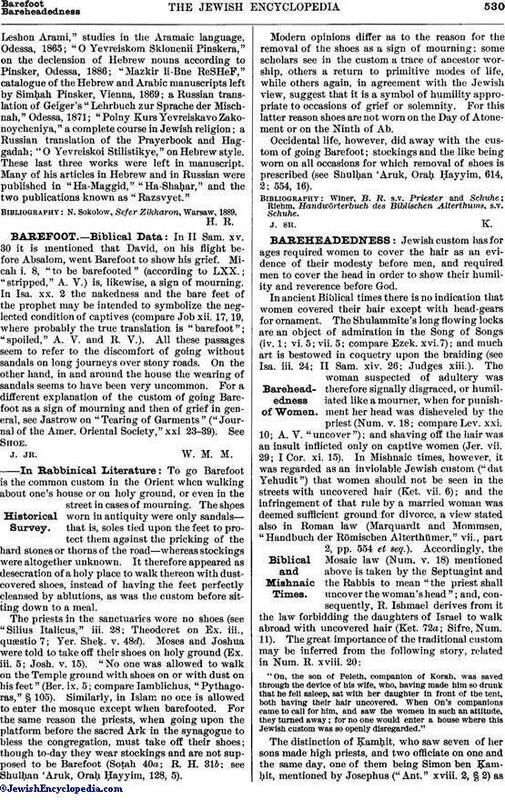 1843, p. 395); of Brunswick, Jan. 14, 1845; of Austria, 1846 ("Wiener Zeitung," 1846, No. 338); of Meiningen, July 25, 1844; of Mecklenburg, April 8, 1848; of Birkenfeld, 1852; of Oldenburg, Nov. 2, 1854; and of Sardinia, 1855. In a trial at a policecourt in London, a Jew swore with uncovered head, and the attorney for his opponent objected to the oath, because, as he said, the Jews did not consider such an oath valid; and the judge sustained the objection ("Jewish Chronicle," Aug. 9, 1901, p. 17). The conservative Jews in civilized countries insist on the covering of the head merely during the performance of religious acts, while the rigid adherents to the ancient custom keep their heads constantly covered, and therefore wear a skull-cap (A. Fürst, "Christen und Juden," p. 296, Strasburg, 1892). 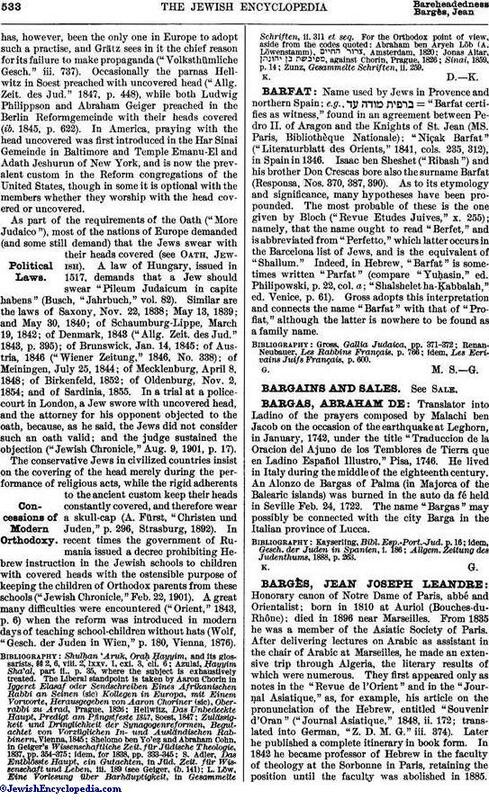 In recent times the government of Rumania issued a decree prohibiting Hebrew instruction in the Jewish schools to children with covered heads with the ostensible purpose of keeping the children of Orthodox parents from these schools ("Jewish Chronicle," Feb. 22, 1901). A great many difficulties were encountered ("Orient," 1843, p. 6) when the reform was introduced in modern days of teaching school-children without hats (Wolf, "Gesch. der Juden in Wien," p. 180, Vienna, 1876). Zunz, Gesammelte Schriften, ii. 259.